A membrane separates a cell from its environment or subdivides a cell into specialized regions or compartments. The structure of a membrane is best understood in light of its component parts and in the context of the specialized functions performed by the cell or by its various, membrane-bound compartments. 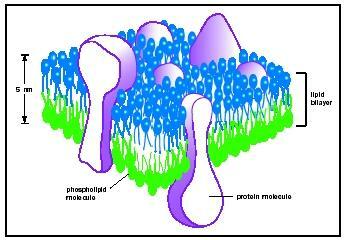 Cellular membranes consist mainly of phospholipid assembled into a stable, sheetlike structure called a bilayer . The process of assembly occurs spontaneously under normal cellular conditions once phospholipid has been synthesized. To understand this process and the important properties of all membranes, it is necessary to appreciate the amphipathic nature of phospholipid structure. An amphipathic lipid is structurally polarized into a molecular region that is hydrophilic and one that is hydrophobic . When the phospholipids in an aqueous environment like cytoplasm reach a critical concentration, they associate into aggregates that are more stable in an aqueous environment than are the individual lipids. These aggregates, or micelles, can assume several forms, but they all have two features in common: The polar "heads" of the phospholipids project into the aqueous environment, and the hydrophobic regions or "tails" are oriented away from water. At low lipid concentrations the micelles are spherical; at higher concentrations, the micelles aggregate to form an extended, two-dimensional sheet called a bilayer. To understand the structure of a bilayer, imagine two single layers of phospholipid, each consisting of polar heads and nonpolar tails, aligned head with head and tail with tail. Then imagine these monolayers coming together in a symmetrical fashion, such that the tails of one monolayer touch those of the other, and the heads project outward away from the tails. The resulting structure is a stable bilayer, with a hydrophobic core and hydrophilic surfaces. Such bilayers can be made in the laboratory. Moreover, compositional studies carried out in the early 1900s by Dutch scientists E. Gorter and F.
Three-dimensional view of a cell membrane. Grendel strongly suggested plasma membranes actually consist of lipid bilayers. When they extracted the lipid from plasma membranes of different mammals, they found just enough to make a monolayer with approximately twice the surface area of the cells from which the lipid was obtained. Thus, they concluded the cells were covered with a membrane consisting of a symmetrical lipid bilayer. More recent studies indicate the lipid composition of one monolayer or leaflet of a membrane may differ somewhat from that of the other, introducing a degree of asymmetry into what is essentially a symmetrical structure. For example, phospholipid containing the sugar inositol as its polar head is found predominantly in that half of the bilayer facing the cytoplasm, whereas lipid containing longer, more complex saccharides (called glycolipids) are found exclusively in the extracellular half of the bilayer. The amphipathic nature of the phospholipid components generates the bilayer organization of a cellular membrane and also provides its three basic properties. First, a bilayer lipid membrane is stable: that is, once formed it stays formed and is unlikely to disintegrate. Such stability results from the weak interactions among the nonpolar tail regions and from the tendency of highly dipolar water molecules to exclude nonpolar molecules from their midst. Thus, bilayers can be thought of as being formed, in part, by the self-adhesiveness of water and its tendency to compact and segregate any substance that is not equally polar. Second, a lipid membrane tends to prevent passage of polar substances; thus, a membrane forms a boundary and compartmentalizes regions of cytoplasm containing relatively water-soluble and nonamphipathic solutes , such as ions , sugars, amino acids , and nucleotides , and much larger molecules, such as proteins , that are unable to pass easily across it. The third and perhaps most important property of membranes is their dynamic nature. A membrane will bend and fold; it can be deformed without breaking. Under special circumstances, such as occurs in vesicle fusion or budding, a bilayer can be broken. When this happens, it very quickly reseals. Moreover, and most important, at room temperature a membrane's constituents are in constant, random motion. In brief, the amphipathic nature of its lipid constituents makes a membrane both a stable and a fluid boundary. Clearly, advantages are conferred on cells and organelles by their being compartmentalized and by the boundary nature of their membranes. Separated from each other, these compartments can differentiate to carry out specialized functions, precisely because the reactants, products, enzymes , and other factors appropriate for these functions are compartmentalized. Moreover, compartmentalized functions are more easily regulated and controlled. No benefit comes without a price, however, and although compartmentalization is a fundamentally important feature of cells, the boundary nature of membranes poses problems as well. For one, a completely impenetrable boundary would stifle cells and their organelles. Thus, lipid membranes are modified to allow various water soluble substances, such as nutrients and waste products, to move from one side to the other. For another, cells and their organelles receive signals across their membranes, and these signaling functions modify the basic phospholipid bilayer structure. Also, cells are anchored to their environments—to other cells or to the extracellular matrix (ECM)—and organelles are attached to various cytoskeletal elements. Directed movement of both cells and organelles are possible when these anchorages and attachments are transient rather than permanent. For the most part, the protein components of membranes serve these additional functions of transport, signal conduction, and anchorage and attachment. Proteins are very important components of membranes, although molecule for molecule they may be relatively minor constituents compared to the vastly greater numbers of membrane lipids. There are three types of basic membrane proteins. Integral membrane proteins (IMP) completely span the bilayer and have regions exposed to both the cytoplasm and to the extracellular environment (or in the case of organelles, to the interior or lumen environment). IMPs may span the membrane once or multiple times, and typically they carry out transport, signaling, and anchoring/attachment functions. Peripheral membrane proteins (PMP) are attached to the membrane, usually to integral membrane proteins, by electrostatic or hydrogen bonds at either their cytoplasmic or extracellular (or lumenal) surfaces; these surfaces are often referred to, respectively, as the C- or the E-face of the membrane. Peripheral membrane proteins are involved primarily in anchoring or attachment. Finally, lipid-anchored proteins (LAP), as their name implies, are covalently bound to membrane lipids and are found associated with either the C- or the E-face of the membrane. Enzymatic and signaling functions are performed by LAPs. In addition to facilitating specific functions, these modes of associations modulate the basic lipid bilayer structure of the membrane. The modern view of membrane structure, known as the fluid mosaic model, was developed in 1972 by S. J. Singer and G. L. Nicholson and reflects three basic features of membrane structure. Integral membrane proteins, when viewed from above one surface or the other, contribute a mosaic or "pebbled" pattern to a membrane, and these proteins and the membrane lipids are capable of lateral movement in the plane of the membrane, due to the fluid nature of lipid association. Lipid-anchored proteins are also potentially mobile as well, moving by virtue of their association with mobile lipids. Any lateral movement of IMPs or LAPs may be constrained, however, by their associations with peripheral membrane proteins in the form of cytoskeletal elements or, outside the cell, in the form of the ECM. Moreover, certain IMPs may be constrained by association with IMPs of adjacent cells in a tissue. These associations reflect the anchoring or attachment functions served by membrane proteins. A third important feature of membrane structure is its asymmetry. Thus, different peripheral membrane proteins are found associated with the extracellular or cytoplasmic faces of membranes and, in turn, are attached to regions of IMP exposed, respectively, at the extracellular and the cytoplasmic membrane surfaces. Membrane asymmetry is also evident in the orientation of IMPs responsible for transmembrane signaling. For example, a hormone binding to the portion of an IMP exposed on the E-face of the plasma membrane can cause the transmembrane portion of the IMP to undergo a conformational change that results in a change in binding affinity in the portion exposed at the C-face. The cytoplasmic region of the IMP might then exhibit enzymatic activity, change the enzymatic activity of another protein with which it associates, or attach or detach from a cytoskeletal element as a result of extracellular hormone binding. Bacteria and plant cells are surrounded by a relatively static and inflexible layer of polysaccharides called a cell wall, which is exterior to the plasma membrane and should not be confused with it. Karp, Gerald. Cell and Molecular Biology, 3rd ed. New York: John Wiley & Sons, 2001. Explain how variation of temperature and pH is likely to affect the normal functioning of the cell membrane.